It was the end of a special weekend. Alan had to present at a conference in Lubbock so we decided to go a couple of days early. It would be a good trip for one of the grands. Evan had been feeling neglected so he went with us. He’d had a great time, swimming, watching movies, eating from the vending machine and sleeping in until he was ready to wake up. He got to pick where we went, what we did and where we ate. He was getting the royal treatment! The presentation was Monday morning so Evan was planning to lounge around, take one last swim and generally milk Mamye all he could before he had to go back home and be a regular kid. He slept in that morning, too late to swim. Instead he decided he wanted to go to Olive Garden for lunch. That sounded fine to me. He showered, dressed and we packed. He changed his mind and wanted to go to Golden Corral instead, which wasn’t as fine to me, but what the heck. It was his weekend. As we gathered the last of our belongings to take down to the car I had him search, once again, just to make sure no treasures were left behind. He picked up the hotel pen and put it on the table. I asked, “Do you want that?” thinking it would be a little souvenir he would remember the weekend by. The last of the parcels in the trunk, seatbelts fastened, preparing to take off, Evan tells me, “This pen doesn’t work. I’m throwing it away”. 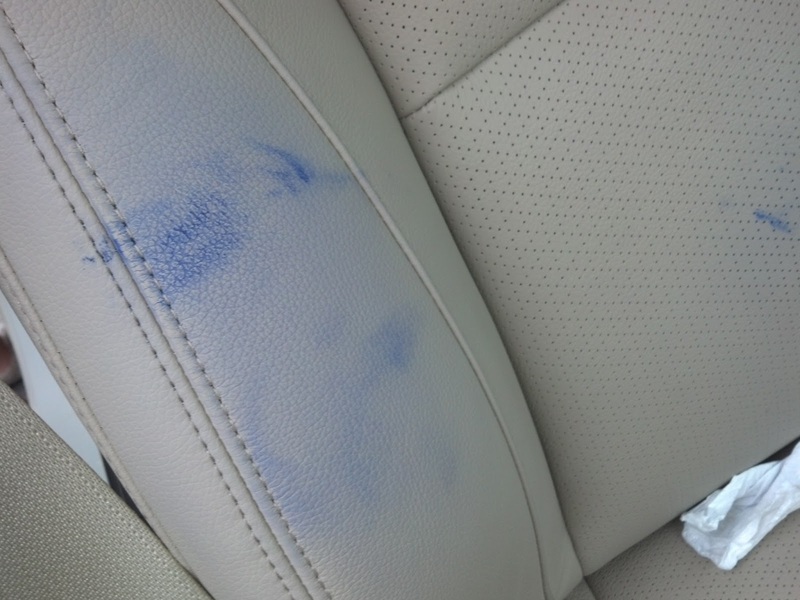 As I look over at him in the passenger seat I see an ink mark by the arm rest. “Evan, be more careful please”, I tell him. I got the hand sanitizer (because I vaguely remembered that alcohol might take off ink) and leaned across him to wipe the stain. He moved over and I saw another mark by his leg on the seat. Exasperated I put the car in park and tell him to get out so I can clean up the mess. He did as he was told and my heart went to my throat. (I actually googled to make sure I was relaying the right emotion. To have one’s heart in the throat means to be full of apprehension, excitement, or fear. To have one’s heart in their boots or feet means to be depressed or down-hearted. I can truly say, from the bottom of my heart, that my internal organ traveled the gamut!) There on the seat behind him was a HUGE ink blob. I was sick. Truly, I felt like throwing up. This was my new car. It’s the car on which I faithfully make mammoth monthly payments. 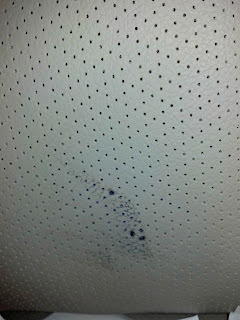 It’s the car with light colored leather seats, now decorated with ink blots that would make Rorschach proud. Miraculously, I stayed calm. I tried the hand sanitizer again, and removed a small amount of ink. But it was obvious there was so much it wasn’t going to work. I beseeched my sweet little car’s GPS system (which is NOT very good by the way), and found an auto part store not too far away. My thoughts were to quickly find some kind of cleaner that might work. I went in and asked the two experienced men at the counter if they had anything that could help. They didn’t. We traveled to another store I saw. This man didn’t know of anything either. He did, very kindly I might add, spray some product onto a rag for me to try. I gave it a shot and when it didn’t work, was thankful that he let me try before I had to buy. He told me to stop by the Mercedes Benz dealer, a few blocks away, and ask for Craig in parts to see if he might know of something. 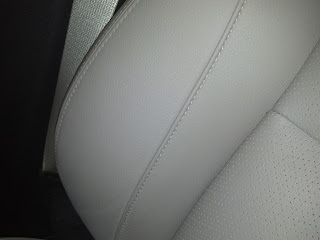 When Evan got back into the car I noticed another large spot. 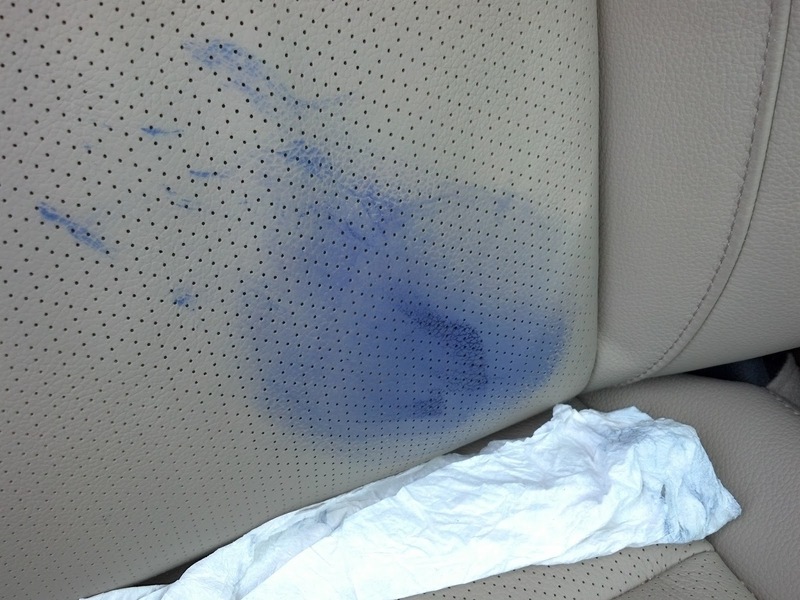 He had ink on his arm and it had rubbed onto the seat. Frantic, I thanked the man and drove to the dealership. I didn’t see a parts department but did see the service department as I pulled up and parked. I went in, explained my dilemma and asked for Craig. Craig wasn’t available but a very nice man, armed with a can of Mercedes seat cleaner came to the parking lot with me. He was so considerate. Here he is, in the parking lot of an elite automobile dealership scrubbing the seat, not of my Mercedes, but of my Honda Accord! I couldn't help but see the humor! He sprayed the cleaner and although the ink seemed to be smearing it was getting lighter. But it was definitely still there. When he’d done all he could I thanked him and he went back inside. We headed to Walmart for more hand sanitizer, rubbing alcohol, hairspray and a towel. Did I tell you I was desperate? I tried them all but to no avail. The ink was there. Resigned, I covered the seat with the towel. The spot on the side from his arm, after cleaning. The main spot after cleaning. A week or so later the towel fell down. 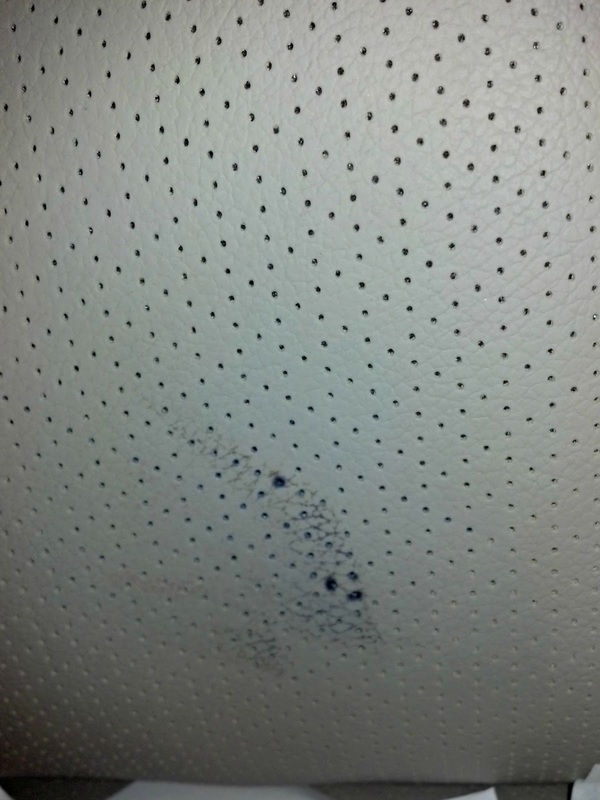 I glanced over at the blemished seat and the stain seemed to be lighter. Could it be? It was probably just the angle. I pulled the towel back up and tried to block it from my mind! Another week went by and the towel again fell down. The stain was definitely lighter. A few days later I looked and one of the stains was gone. The other was faded quite a bit. It’s been almost a month since the traumatic event. I have no idea what’s in that Mercedes cleaner but the ink is faded and the last spot is almost gone. It’s a miracle! I wish I’d gotten the name of the nice man who helped me. I’d write him a thank you letter. It's almost gone. What's up with that? I’ll probably never get the chance to own a Mercedes. But if I do I’ll buy it at Alderson Mercedes in Lubbock. I have some beautiful handspun yarn from my friend Brenda. 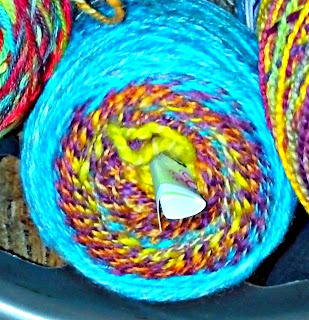 Yarn my friend Brenda spun. I've just finished the Quaker Yarn Stretcher on Ravelry. 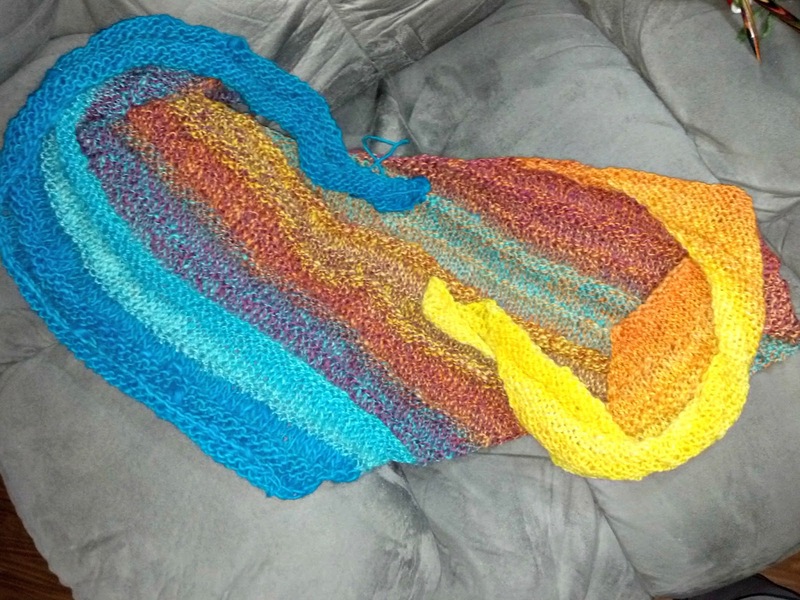 All that’s left is the blocking! Quaker Yarn Stretcher designed to use your handspun yarn. So oh Lord, won't you buy me a Mercedes Benz ? That is so crazy! I am so glad that it is coming out! It is the weirdest thing ever. But I'll take it! Might have to visit a MB dealership. That's what he said it was for! Might be worth checking! Wow, what an amazing story about the ink. Need to just have a "reading Jayme's blog party". I am so behind! You did a beautiful job with the handspun, I can't wait to see it in real life!